Breadcrumbs can be complimented – didja know that? I didn’t until I started writing this post and realized just how much there is to know and how much I’ve picked up over the years as I’ve made breadcrumbs here and there. First of all, they’re pricey at the store! I was asked to pick up some once for a friend while I was on the way to dinner and about had a heart attack!! Besides, home-made breadcrumbs are far superior. Seriously better than any store-bought crumb. 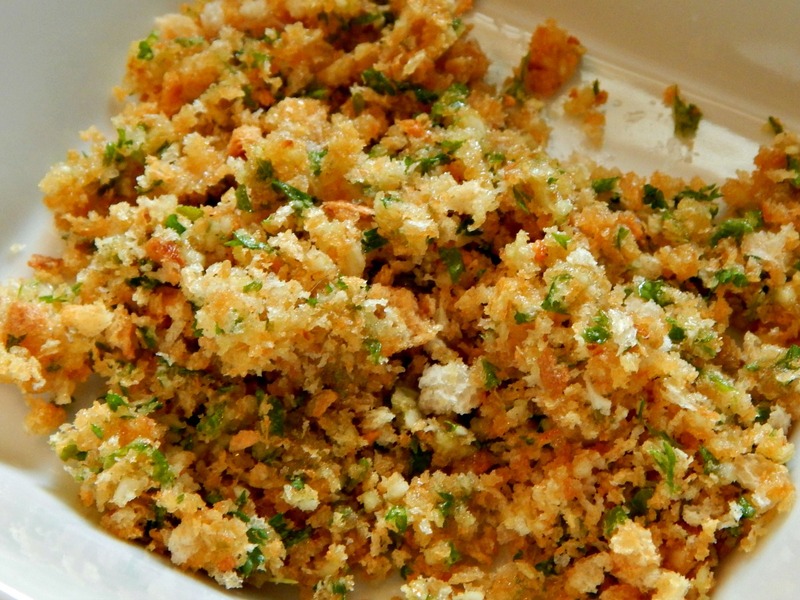 Get in the habit of making breadcrumbs with leftover or stale bread and toss them in the freezer. You’ll always have breadcrumbs on hand. Three slices of bread will give you about 1 1/2 to 2 cups of bread crumbs, depending on how finely they are processed. Remove the crust for the best breadcrumbs (the crust often does not cook up uniformly for some applications) or leave it on if you’d like to be more frugal. If your bread is too hard, but still good just cover with a damp paper towel and microwave at 20 second intervals, then proceed. If your bread is really dry, try breaking it down by using your rolling pin instead of breaking it down with the food processor. There are different breadcrumbs for different usages. They can be fresh, dried, toasted, flavored or a marvelous breadcrumb topping can be made for casseroles or crusts. My directions are for a food processor but a large holed grater or a blender work well, too. Cut as many cubes of bread as you’d like into one inch cubes. Working with a few at a time and never filling the food processor more than half full, pulse until desired consistency is reached. Remove to a bag and freeze. Fresh crumbs most often seen used inside of things, often soaked with milk. Things like meatloaves or meatballs. They’re handy to have on hand. If you need toasted, you can pull a few from your freezer and toast them up as the oven preheats. To make buttered breadcrumbs, melt a little butter, about a tablespoon in a small pan and add about 1/2 cup of fresh breadcrumbs. Stir until golden brown. Fill food processor about half full with bread in about 1″ cubes (without the crust) and pulse until crumbs are formed that are uniform in size. Remove from food processor, lay out on a sheet pan(s) about 1/4 inch deep and bake for about 14 – 20 minutes at 250 degrees F. Stir often. Remove when barely golden brown. Make as many as you’d like but only fill the food processor about 1/2 full each time and don’t over fill the sheet pans. Timing varies with the oven, the sheet pan and the amount of crumbs. Toasted Breadcrumbs have a zillion uses. Use them (flavor as the recipe directs) to dredge anything fried or as a base for Breadcrumb Topping, below. Fill food processor about half full with bread in about 1″ cubes (without the crust) and pulse until uniform in size and crumbs are formed. Remove from food processor, place in a large bowl or pan and shake so the fine crumbs fall to the bottom. Remove the larger crumbs from the bowl and spread thinly on a large cookie sheet and place in oven to dry. Stir often and remove when crumbs are dry but haven’t picked up any color. Let cool at room temperature. Time varies depending on the amount of crumbs. Make as many as you’d like, working in batches. The finer crumbs may be saved and used as desired. Two things really separate Panko Crumbs from our typical American style bread crumbs. They don’t have any color and they are made up of very hard, jagged crumbs. Panko crumbs are “screened” so the finest crumbs aren’t included and ones left behind are rather large and uniform. I don’t “screen” mine, but make a little effort with the shaking to leave behind the finest of the crumbs. Panko shines in deep fried foods. When baking and using Panko as a crust, you may find that it does not color as well and is so crunchy the texture isn’t really expected and can be off putting. Many recipes over the years have relied on using a Progresso type crumb as a short cut. This will free you up from buying those premade cans. When topping a casserole that won’t be in the oven long enough to brown bread crumbs, I often start out with a bread crumb toasted until it is golden. Heat oil or butter in a small skillet. Add garlic and cook for about 30 seconds. Add breadcrumbs and desired herbs and toss until well coated and topping is golden brown. Remove immediately from hot skillet, toss with cheese if using, and set aside. Note: if herbs are dry, toss them in the butter or oil with the garlic. If fresh, add them after removing the breadcrumbs from the skillet. All kinds of herbs go well in this topping. Basil, parsley, thyme, oregano, tarragon, etc. Some of the cheeses that work well are Parmesan, Romano, Asiago or any other hard cheese. When working with any bread crumb topping, starting out with a toasted bread crumb helps speed along the browning process and is ideal for items that spend short time periods in the oven: Casseroles, boneless chicken breasts and fish, for instance. Mixing the crumbs first with olive oil or butter helps promote gorgeous browning and crunch and works out so much better than adding crumbs, spraying them with cooking spray and hoping for something that looks and tastes good. To get a great crust on baked fish or chicken: Save a bit of the bread crumb topping out, and gently press the rest of crumbs on the fish or chicken so they adhere. Sprinkle the remaining over the top, and you’ll have a beautiful crust with dimension rather than something that looks flat and contrived and you’ll find it has more crunch than if you had just simply pressed the crumbs on. This entry was posted in Click here for Fabulous Food Posts and tagged Bread, breadcrumbs, Frugal Hausfrau, leftover bread, Leftovers. Bookmark the permalink. I was never interested in learning to cook until I was an adult living on my own and kind of had to.